My name is Frank and with my experience on using Omni's magnetic water treatment technology I recommend to all farmers who take their business seriously to use Omni's water treatment system and receive the benefits. 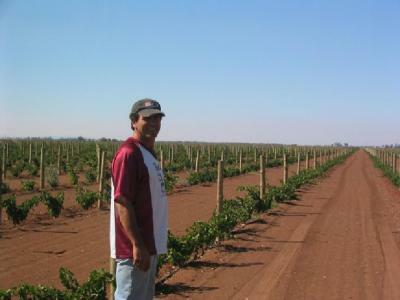 I own and work 1800 acres of vine grape and have partnerships in another 2000 acres with my brothers. When working big farms and having water issues one can not afford not to look for new ideas that might save water. In October 2006 I purchased only one of Omni's magnetic water treatment systems to try it on a section of the farm. Several days after the first watering with Omni's water treatment system I compared the section using treated water against the other and noticed the moisture was retained in the soils for days longer in the section that Omni's magnetic device was used.Realizing that we could save a lot of water we ordered another four magnetic systems and treated the water for the entire farm. This was a great investment I made for the farm because it paid for it self in the first season by saving 20% to 25% water, increased my production and produced a much better quality crop.